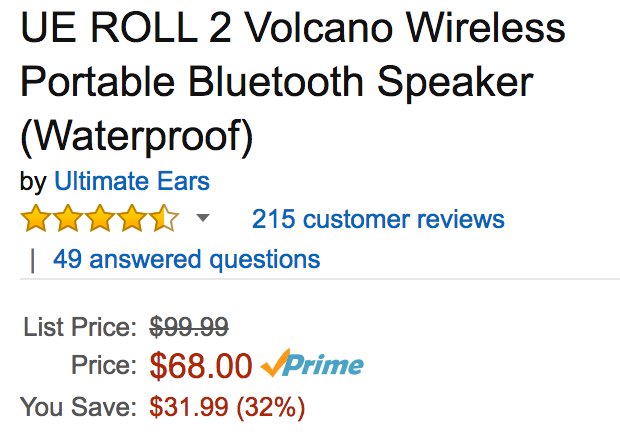 Amazon offers the UE ROLL 2 Portable Bluetooth Speaker in Volcano for $68 shipped. Also at Walmart. That’s $32 off the regular going rate and an Amazon all-time low. Rated 4.4/5 stars by over 200 reviewers. Wireless Capabilities:Pair up to 8 Bluetooth enabled devices – Connect up to two source devices at the same time. Wirelessly play (stream) to 2 UE ROLLs from one source. Mobile range of play is up to 20m or (65ft). The big, bold, beautiful sound of UE ROLL 2 gives adventure a soundtrack. Sound so loud, you’ll have to shout to be heard. It’s an ultra-portable wireless Bluetooth speaker that goes where you go with a stretchy, attachable bungee. You can even attach it to a kayak–it’s totally waterproof. Use the UE ROLL 2 app to control the party from afar. Control the party from afar and get easy wireless updates with new features like Block Party music sharing from 3 friends’ mobile devices. Future-proof updates mean your UE ROLL 2 gets even better and more fun over time.